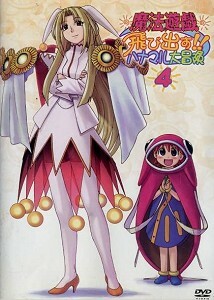 Mahou Yuugi 2D/Magical Play is Japanese anime TV series, which was released in 2001. Padudu is a 12-year-old apprentice witch, chosen to represent her town in the coliseum. Donning her magical fish costume, which keeps her warm and fed, she sets off on her journey. But on the way she's swept away by a river to Dance Valley. Mayor Koffy captures her and throws her into the dungeon, hoping to eliminate the competition for Dance Valley's own coliseum candidate. Luckily for Padudu, this dungeon holds the mysterious witch Nonononn. hey join together in a magical fight for survival. At the end of Blue Gender Trailer, the Magical witchland word came out! 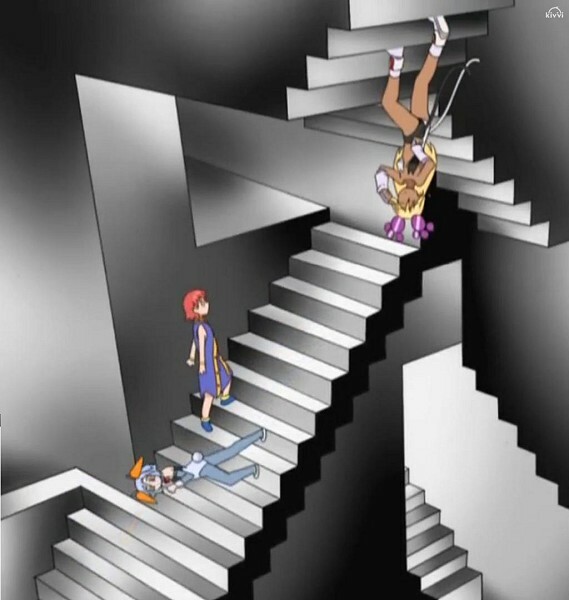 In the 9th episode there's room with gravity paradoxes like in Escher's Relativity. See image, which was composed from several frames, below.